Those of us with depression-era parents or grandparents have been raised to avoid waste at all costs. That makes many of us loathe to throw any kind of food away, even when it starts looking somewhat dodgy. Bread is one of the foods that is most likely to go moldy, because it is often kept in a warm, dark place, like a breadbox or cupboard – perfect conditions for mold to grow. So, is it safe to just cut off the green bits and eat the rest as many of us have been taught to do? To find the answer to that question, we need to consider what mold really is. While mold is part of the fungi family (just like mushrooms), that doesn’t mean it’s edible. Molds can cause respiratory problems and allergic reactions, and breathing in mold spores can be dangerous. In addition to the spores that are visible on the surface, there are also microscopic roots that dig deep into the food and are not visible to the naked eye. Some people believe that just cutting out the bad bits is sufficient, but experts stress that this is not a safe option. In other words, what you can see with the naked eye is very likely only the tip of the iceberg, so to speak. And some molds can produce secondary poisons called mycotoxins; think of the mold as the gun and the mycotoxins as the bullets. Grains like wheat and barley which have been stored for months in a silo already likely contain one of the most harmful mycotoxins – aflatoxin – which has been linked to liver cancer. The American Food and Agriculture Organization estimates that a quarter of all food crops in the world are affected by mycotoxins. By the time the bread has started growing mold it is therefore likely to be very contaminated. Though experts suggest that it may be safe to eat sliced bread that looks unaffected by the mold, it is actually really safest just to chuck the whole loaf away. To safeguard your family, particularly little ones, be sure to wrap the bread up in a plastic bag and ensure that it is in a covered trashcan. 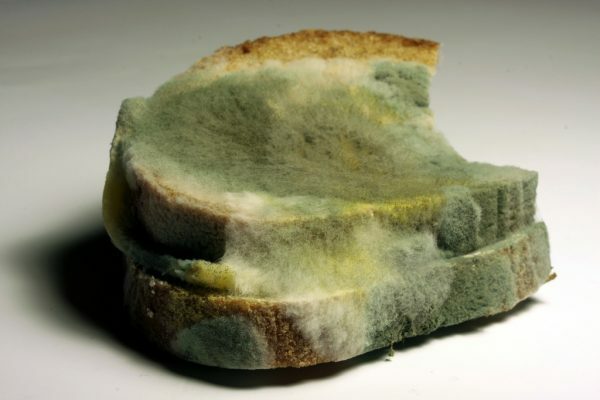 Tell everyone in your family that they should never sniff moldy bread, as this can cause respiratory problems. Mycotoxins are present in many other foods besides bread, and when ingested over a period of time can cause a multitude of health problems, including liver and heart disease, diabetes, neurological problems, asthma, autoimmune disorders, and even stunted growth and death. Coconut oil (if sourced from dried coconuts). What does mycotoxin poisoning look like? Oasis Advanced Wellness notes that symptoms of mycotoxin poisoning include fatigue, a runny or stuffy nose, rapid weight gain or loss, difficulty sleeping, leaky gut syndrome, and behavioral issues, among others. A complete list of symptoms can be found here. There are several steps you can take if you suspect you have been poisoned by mycotoxins. A grain-free diet and completely eliminating sugar is a good start. Efforts should also be made to ensure that your environment is completely free of mold. Colloidal silver, nascent iodine and oregano oil are useful supplements to help detoxify. You should also increase your intake of herbs and vegetables that fight fungi, including garlic, kale, cayenne, carrots, ginger and goldenseal.